Letter from India – 7am kick off! We knew that our first game of the tour was to be an early kick-off but any hopes of a quiet day before were quashed when we saw our schedule. We started off with a visit to a state run school to introduce the girls to touch rugby. The pupils were obviously excited to see us but their behaviour was impeccable throughout. After the opening formalities we split into two groups, one to take a touch rugby session and the other led by parliamentarians to talk about the British political system and to find out more about the school. There are six women on tour with us and they were a big hit with the girls, particularly when they spoke about women playing rugby and women in politics. We then left for a private school where the format was much the same, but we had spent so long struggling through the Delhi traffic that a third visit had to be cancelled as the students would have left for home by the time we got there. Back to the hotel where we had a couple hours before changing for dinner at the Bukhara, reputed to be the hest Indian restaurant in the world. Bill Clinton and Vladimir Putin always eat there when they are in Delhi. 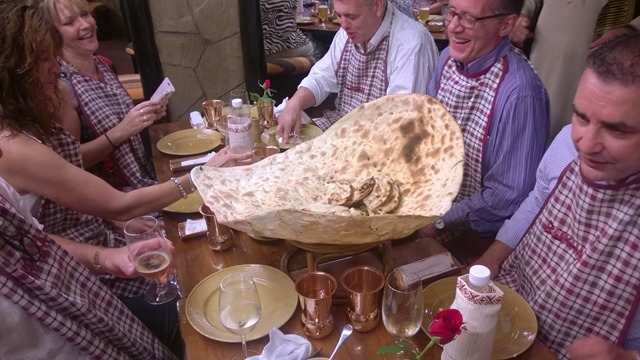 The food was excellent, all of it grilled or tandoori, with a mixture of prawns, chicken and mutton and the most enormous naan bread I have ever seen. However I thought it was ironic that we were doing what all rugby players do on tour; go out for a curry and lager! We ate and drank our fill and returned about 11:30pm with the sobering thought that we would have to leave at 5:30 am the next morning. Bleary-eyed, the tour party gathered in the hotel lobby for a hurried coffee before getting on the coach to get to the ground in Delhi. When we arrived there was a lot of activity despite the unearthly hour and a number of dignitaries had gathered. There was a DJ with sound system and drummers and a couple of hundred people keen to see how their local rugby team would get on. The Hurricanes looked young and fit but fortunately they leant their visitors a number of players. The game was much more even than many expected, the borrowed players able to add some pace to the older, heavier Commons & Lords pack who could use their greater experience of the game to keep it tight. The Hurricanes scored first but that proved to be the only score of the first half, then Commons & Lords evened the score ten minutes after the break. 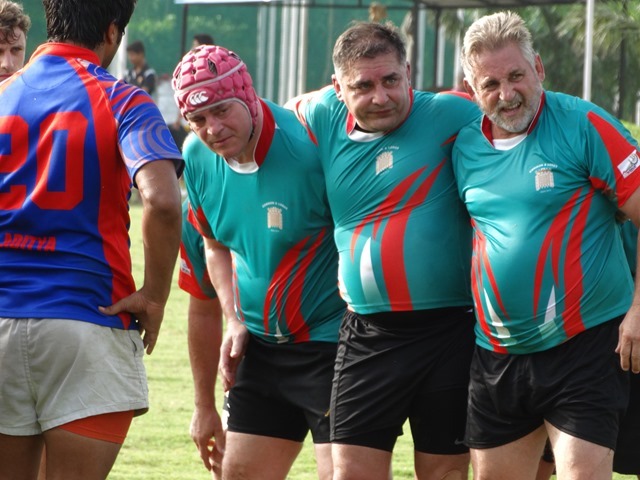 The stalemate was broken when Delhi crossed the line for a converted try, and although the parliamentary side pressed for an equalising score, Delhi held out for the victory. A bit of sad news was that Paul Duncan who is a regular Commons & Lords players snapped an Achilles tendon, and after a visit to the local casualty department he will have to go home for an operation. I am sure all wish him a speedy recovery. Despite being barely nine in the morning it felt the the tourists as if it was mid-afternoon after the very early start so the beers were broken out and both teams celebrated a good game. Click here for a video of post-match drumming and dancing. Presentations were made before we got back onto the coach to the hotel to shower and change and get ready for a day of more school visits and a reception hosted by the Confederation of Indian Industry.